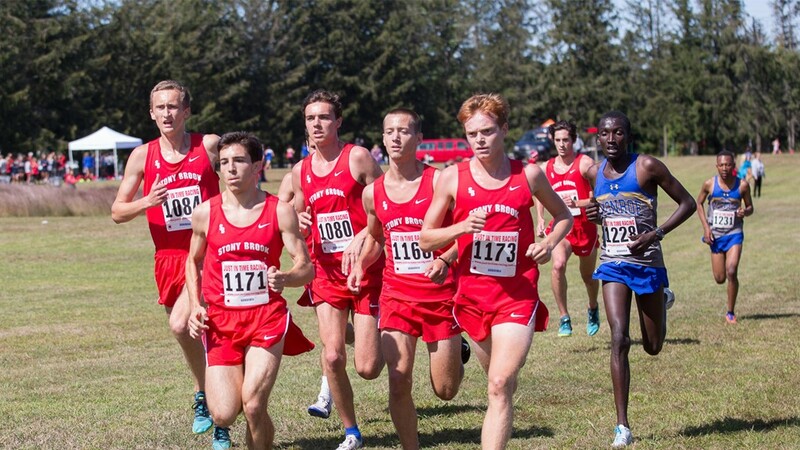 The Stony Brook men’s and women’s cross country teams placed ninth and 13th respectively at the NCAA Regional Championships at the Audubon Golf Course in Buffalo on Friday, Nov. 9. Some of the key runners who contributed to the women’s team’s 13th place finish in the 6k meter race were seniors Annika Sisson and Tiana Guevara, who finished 56th and 89th with times of 23:03.3 and 23:35.1 respectively, over 6,000 meters. Freshman Klaire Klemens finished 92nd with a time of 23:36.9; juniors Clodagh O’Reilly, Alexandria Ortega and Holly Manning finished in 94th, 101st and 119th with times of 23:38.9, 23:44.1 and 23:55.6 and senior Talia Guevara finished 126th with a time of 24:02.4, respectively. Head coach Andy Ronan spoke about the women’s effort following the competition. “While we finished in front of our conference rivals, Albany, UMass Lowell and Vermont, we fell short of the top 10 finish we were aiming for in today’s meet. A couple of our top athletes under performed in the conditions and it cost us. Freshman Klaire Klemens had a very good run, with solid efforts from Tiana, Holly and Clodagh,” Ronan said in a press release after the races. On the men’s side of things, a ninth place finish isn’t what they were expecting. Runner’s times in the 10k meter race included seniors Michael Watts and Darian Sorouri finished in 31st and 40th with times of 33:43.1 and 33:58.2 over 10,000 meters. Junior Vann Moffett finished in 49th with a time of 34:08.5, senior Danny Connelly finished in 76th with a time of 34:38.2, junior Cameron Avery finished in 78th with a time of 34:40.2, senior Kevin Vinolas finished in 110th with a time of 35:10.5 and junior Kyle Kelly finished in 117th with a time of 35:17.2. The Seawolves return to action when they travel to the Eastern College Athletic Conference’s IC4A Championships at Van Cortlandt Park in the Bronx on Saturday, Nov. 17 at 11 a.m. As the season comes to a close following this meet, Ronan believes his team’s production hasn’t been all there. “It has been the story of the season, we have failed to produce that total team performance, the result being that we are nearing the end of the season without accomplishing our goals.” Ronan said.